A feud over rent causes a rift between two families in a heartfelt drama that has a lot to say. Rating: 3-and-a-half out of 4 stars. Ira Sachs’ lovely, heartfelt drama “Love Is Strange” had at its center a New York City real-estate problem — as does his new film, the equally splendid “Little Men.” A Manhattan family — the Jardines: father Brian (Greg Kinnear), mother Kathy (Jennifer Ehle), 13-year-old son Jake (Theo Taplitz) — move to Brooklyn to live in a small building inherited from Brian’s late father. Their new home is a modest apartment above a storefront rented to Leonor (Paulina Garcia), a single mother who runs a not-very-profitable dress shop there, and whose son Tony (Michael Barbieri) quickly becomes friends with Jake. Leonor, however, has long been paying below-market rates in a gentrifying neighborhood, and when Brian and Kathy try to raise the rent, hostilities develop among the adults. Sachs doesn’t make it easy for us to side with anyone: Brian and Kathy, though they don’t handle the rent hike with much sensitivity, genuinely need the money (they’re not wealthy; he’s a struggling actor); Leonor, who’s also feeling financial pressure, angrily refuses to discuss any sort of compromise. Instead, the camera wanders over to the boys, who are mystified and troubled by the feud. Why can’t the adults just fix it? Why is everybody so upset? 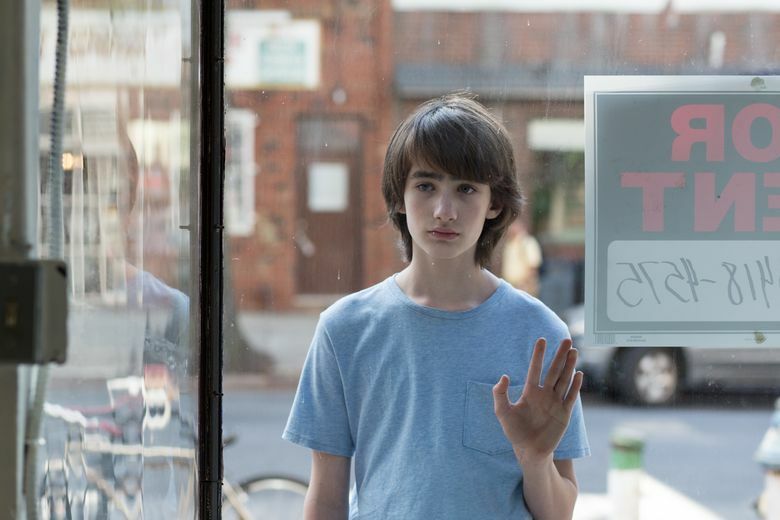 In its brief, intimate 85 minutes, “Little Men” has much to say: about how a neighborhood, and an apartment, changes (note how the Jardines quickly replace Brian’s father’s weathered wallpaper with a clean wash of pale beige); how emotions in a family don’t always extend across generations; how money can enter a conversation and poison it, like a bad smell; how a 13-year-old boy, his voice still a highish squeak, is gathering himself to begin to step away from his parents and toward the person he might one day be. Jake, a budding artist, is angered early on when his father, who’s tidied up by tossing some of Jake’s art, suggests creating some new works. “New ones are never going to be like the old ones!” says the boy. That’s true for drawings, for apartments, and, he learns, for friends. ‘Little Men,’ with Greg Kinnear, Paulina Garcia, Jennifer Ehle, Theo Taplitz, Michael Barbieri. Written and directed by Ira Sachs. 85 minutes. Rated PG for thematic elements, smoking and some language. Sundance (21+).